Diving Site Map:Detail and positional relation of Hilutungan Island and Nalusuan Island dive site near Mactan Island and island dive site near Cebu Island, points which can be expedited from Cebu Island. Information and fee to scuba diver. 1) Cebu City and Mactan Island, the center of diving industry, which serve blooming dive sites nearby Mactan, with lots of marine sanctuaries, the Hilutungan and Nalusuan Island,among others,as base also of diving trip to Bohol, Negros, Malapascua, Moalboal, with world class hotels and resorts. 2) Moalboal Dive Resorts, located in southwest of Cebu, 80kms. 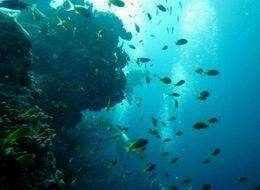 away and 3 hours drive from Cebu City, with beautiful dive sites, especially the Pescador Island. * K I Marine Sports Center's Dive Shop is based in the center of Mactan Resort Hotels, mainly serve the famous dive sites nearby Mactan, the Hilutungan Island and Nalusuan Is. Marine Sanctuaries and many more variety of dive sites .Please view our location and services, with Dive safaris, Discovery Diving, Diving License and more.